Alright so I’ve got a bit of extra time today. So I guess you all get a second review. 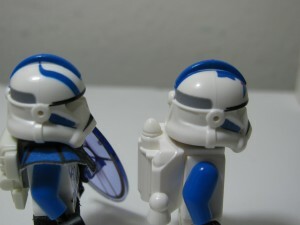 Next up is the Clone Commander Helmets. 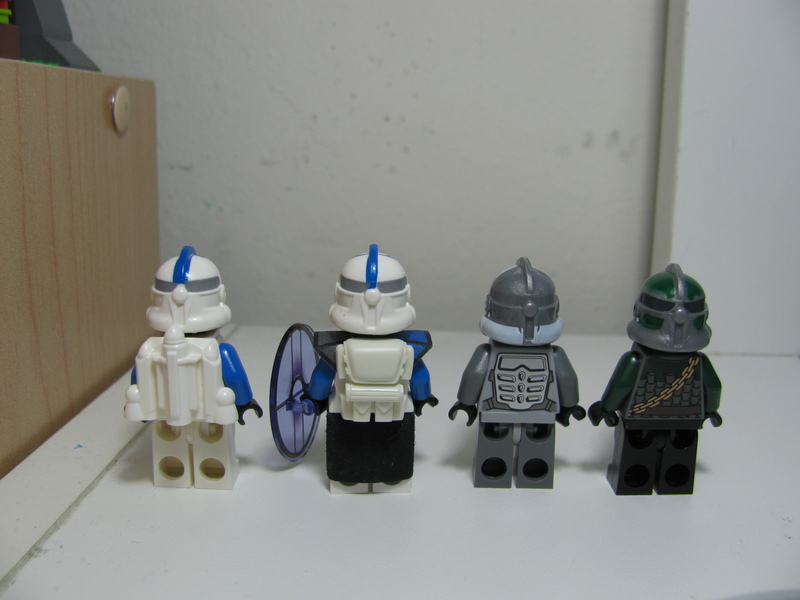 Fives Helmet: Exoforce Torso, Series 1 minifigure Astronaut Legs and Arealight Jet pack. Echo Helmet:Arealight’s Female Trooper Torso, Custom Printed Legs from Bricklink, Waist cape and Pauldron from MMCBCapes, Amazing Armory backpack. Colt: Power Miners Torso, Pauldron from Christo on Ebay, Modified KZ Armor from Hazel Fantasy(Amazing Armory). 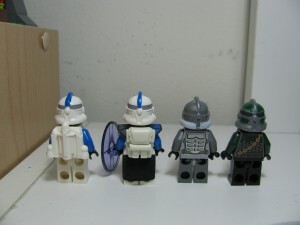 Gree: Lego Kingdoms Torso and Legs. Alright, so let’s go ahead and start off with the Fives Helmet. The design matches Fives Arc helmet quite well, however since these are printed onto Arealight’s Commander Helmets there is no Phase 1 fin. 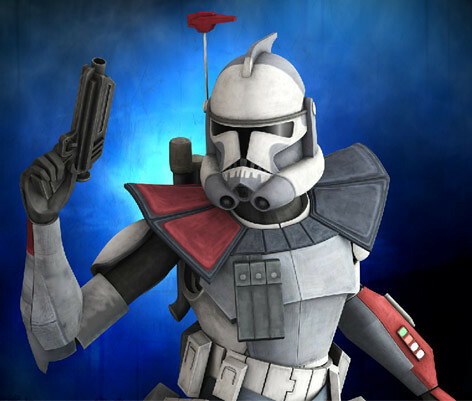 (As a reminder: Arealight currently does not have Clone wars Arc Trooper helmets in any of his plans yet; I have already asked :P) The Echo helmet is also just as crisp of a design, but it is a tad less accurate due to the markings on the top of his helmet being one tone rather than two tone in the reference photo I had seen. However both helmets have clean and crisp printing and honestly you really can’t go wrong with it unless it just really bugs you that there’s no Phase 1 Fin. 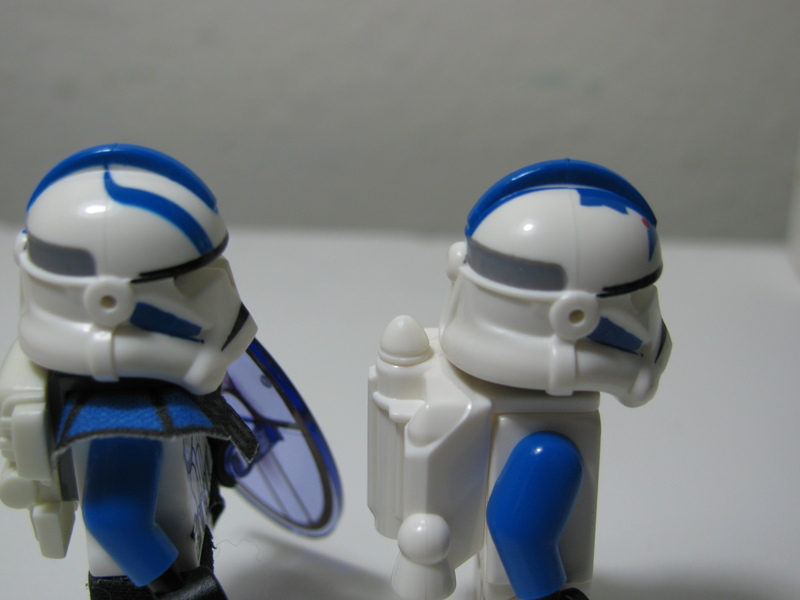 There is a very very miniscule print error on my Echo and Fives helmets, the printing is shifted goes a bit out of indention. I also think that had Arealight added the hatch marks onto the bottom of the sides of the helmets similar to his previous helmets it would have turned out much better. However these are still great helmets and I love the designs. Now moving on to the Colt helmet. This helmet is a bit interesting as it doesn’t really match the reference as well as the other helmets. It’s white printed onto a silver helmet like Gree. However, since white is often transparent, the white appears a light gray color. The printing on this helmet really isn’t as good as the other ones as it sort of messes up once it gets to the fin. The design it self would be really nice had it been printed the other way around (Grey on white) or if the printer was able to lay down a better coat of white ink. As you can see, the design sort of curves and the ink sort of thickens at the edge of the design. It’s a helmet that I feel could have been executed better, but what’s done is done. Most likely, I’ll be going over the ink with a coat or two of white paint to clean the look up a bit. 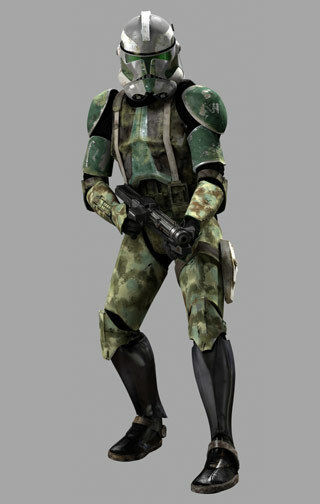 Now for the Gree Helmet. 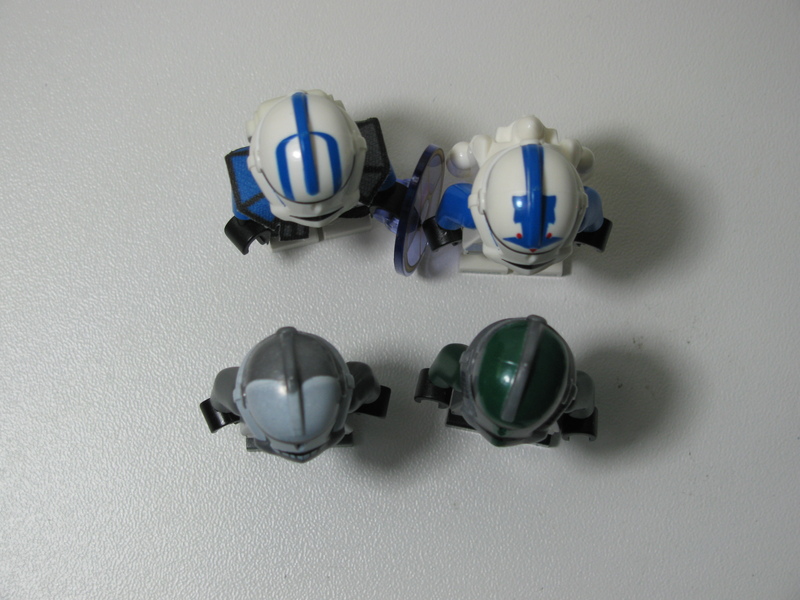 The Gree Helmet is quite nice actually; like the Colt helmet, it is printed on silver. The silver color of the plastic matches Lego’s Dark Bluish Grey color, the green is a bit darker due to the color it is printed on but it matches the reference quite well actually. The design is pretty nice and the printing is very crisp, but it isn’t completely without fault unfortunately. The printing on the back of mine is a bit out of the indention it was made for. However I’m pretty sure this is just a misfire on the printer’s behalf. Over all, I like these helmets. I would say that if you want to order a few you should. 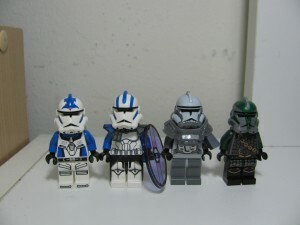 You have a really big selection to choose from, but if you want to order some of the Wave 2 ones; I would suggest either the Echo or Fives Helmet. Both of which have fantastic detailing and design work. Once again, there should be a few more reviews coming a long this week.